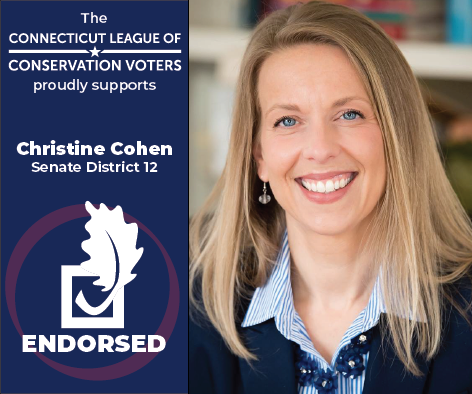 The Connecticut League of Conservation Voters (CTLCV)—a bipartisan organization dedicated to protecting our environment by making it a priority for our elected leaders—​endorsed Christine Cohen (D) to represent the 12th Senate District. Cohen is the owner of Cohen Bagels in Madison and a member of the Guilford Land Trust. She has demonstrated real concern about carbon emissions and pollution in Connecticut, and has already taken steps to ensure her own business operates in a sustainable, environmentally responsible manner. With the latest reports from the United Nations saying we only have 10 years to cut emissions and act on climate change to avert catastrophe, we need leaders like Christine Cohen who are committed to our environment. Christine signed our Clean Energy for All pledge, vowing to transition Connecticut to 100% clean energy by 2050 or sooner. This will cut emissions, create jobs, and help us fight climate change.